What Does The Bible and Biblical Prophecy Say About Blood Moons? There is much talk in Christian circles these days about ‘blood moons’. Books are being written about them, documentaries are being filmed in an attempt to explain what they are and their significance to Christians and, indeed, mankind. What are ‘blood moons’? Do they have biblical support? Let us take a moment to look into this issue and see what we can discover. What is a ‘blood moon’, astronomically speaking? A ‘blood moon’ occurs when the Earth comes between the sun and the moon. The sunlight shining through the atmosphere of the Earth casts a red shadow on the moon, making it appear red. Single blood moons happen regularly; however, a series of four blood moons, called a “tetrad”, has only happened a very few times in the last 500 years. Many people see great significance in the appearing of these blood moons. Pastor John Hagee has written a book about the upcoming blood moon sequence in which he writes, “There’s a sense in the world that things are changing and God is trying to communicate with us in a supernatural way…I believe that in these next two years, we’re going to see something dramatic happen in the Middle East involving Israel that will change the course of history in the Middle East and impact the whole world” (1). Pastor Hagee cites, as biblical support, the fact that, in the Bible, God often speaks of using astronomical signs to get the attention of humanity (Isaiah 13:10; Joel 2:31; Matthew 24:29; Acts 2:20, etc.). In fact, in Genesis, we read, “And God said, ‘Let there be lights in the expanse of the heavens to separate the day from the night. And let them be for signs and for seasons, and for days and years…’” (Genesis 1:14 ESV). Pastor Hagee also notes that, “In the past, the rare appearance of four blood moons on [Jewish] feast days has coincided with major events for Israel and the Jewish people” (2). Hagee sees this as further confirmation that there is great spiritual significance in the blood moon event. Pastor Hagee is not alone in his beliefs, nor is he the only one writing and speaking about the blood moons. A pastor named Mark Biltz has also written a book, entitled Blood Moons: Decoding the Imminent Heavenly Signs, and is in agreement with Hagee that there is great significance, for the nation of Israel and the world, in the blood moons appearance (3). Author Doug Drake believes that the blood moon’s appearance is a message for people who are lukewarm or apathetic in their relationship with God (4). A ‘blood moon’ occurs when the Earth comes between the sun and the moon. The sunlight shining through the atmosphere of the Earth casts a red shadow on the moon, making it appear red. Others take issue with the claim that previous tetrads foretold upcoming events affecting the nation of Israel because these tetrads actually appeared after the events happened that they were seen to foretell (5). It makes sense that God would not send signs of warning after the fact. Every biblical warning God gave came before the event warned about took place. In that way, those who believed God’s Word would have the opportunity to repent and avoid the predicted judgment. In an article in the Daily Oklahoman [my local newspaper], Dr. Mark Hitchcock said he doesn’t believe the eclipses [the four blood moons] are related to Bible prophecy. Dr. Hitchcock has written a book also, called Four Blood Moons: Something Is About to Change, which counters Pastor Hagee’s book. Hitchcock says that he views the current blood moon issue as something akin to the Mayan calendar idea in 2012. He sees those who are seeing prophetic significance in the appearance of these moons as having the same mindset as those who have set dates for the return of Jesus Christ. In the Oklahoman article, Hitchcock says, “…some of the people touting the blood moons prophecy have not set a specific date but are setting a specific time frame for Christ’s return, relating it to the lunar eclipses” (6). As far as ascribing prophetic meaning to the appearance of these four bloods moons, in 2014 and 2015, we once more have an issue affecting Christians, and Christianity, that has faithful believers on both sides of the issue. Some believe that the upcoming tetrad has profound spiritual significance for the nation of Israel and the entire world. Others believe that these people are misguided in their theories. Here is what we know. God has provided us with everything we need to know to worship Him, be forgiven of our sins, and be granted eternal life, in His Word, the Bible. During Jesus’ life, He provided His generation with all the truth they needed to believe in Him. Even so, many came to Him asking Him for further proof. His response to these people could be applied to the issue of the blood moons, He said, “Why does this generation seek a sign? Truly, I say to you, no sign will be given to this generation” (Mark 8:12 ESV, cf. Matt. 12:38, 16:4; Luke 11:28-30). No matter whether the upcoming blood moon event has any prophetic value or not, humanity has no excuse for continuing to rebel against Him and reject His lordship. Therefore, while the appearance of these blood moons may or may not be an important prophetic sign, they can provide an occasion for Christians to have the opportunity to share the Gospel with unbelievers who desperately need to hear its saving message. May we not waste the moment. Related reading: – End times: Are we in the Last Days? Resources – Scripture quotations are from The Holy Bible, English Standard Version® (ESV®), copyright © 2001 by Crossway, a publishing ministry of Good News Publishers. Used by permission. All rights reserved. (1) (2) http://www.cbn.com/cbnnews/insideisrael/2014/February/ Divine-Sign-for-Israel-Hagee-Explains-Blood-Moons/. 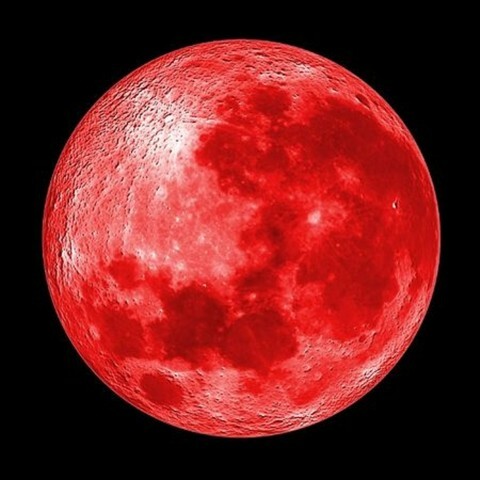 (3) (4) http://www.wnd.com/2014/04/ blood-moons-a-special-message-to-america/#CiUfYVVZU9D5FPqJ.99. (5) http://americanvision.org/9839/blood-moons-prophetic-speculation/#sthash.jPi41oqx.oS1sP303.dpuf. (6) The Daily Oklahoman. Local pastor discusses ‘blood moons’ prophecy. Saturday, April 5, 2014. pp. 1D and 3D. to do with this article? I will pray for you, right now. Please let us know when the job arrives and its details. Granted anything can happen and I don’t want to be a scoffer, but as far as these blood moons are concerned, I am. Does anybody who has dealt with atheistic evolutionists really think the color of the moon is going to make them cry out to God? This is not the middle ages, or prior, when men thought a simple eclipse was a portend from their gods. I could hardly get through the book as it follows the line of so many Christian fringe elements who are seeking signs of His coming. I think it does more harm than good, not to these author’s bank accounts, but to those who claim the Name of Christ. It marginalizes Christians, once again, to the lunatic corner and makes those things, which are true concerning God, harder to be believed by those observing “our” fringe Christian leaders and pastors. We had similar warnings by regional evangelists proclaiming(loudly) that the end was near when Y2K approached. These heralds were frothing at the mouth with accompanying Bible waving and gesticulations appearing perhaps like Ezekiel and Jeremiah must have, to the local populaces during their times, claiming that civilization as we know it is about to end…lunatics…. Yet they still have their popular radio and television shows! Christians have short memories. There is a rub, though….they may be right. I guess I read the book about the boy crying, “WOLF”, one too many times though. As you so well said, our main purpose is to follow Christ and help others to do the same. Its just a good thing for these modern day “prophets”, that the broader Christian community “does not, keep a record of wrongs”(1 Cor 13:5). Otherwise we would remember the warning about false prophets. Once 2015 is past and the sales from their books settle down, we will forget, once again, as they raise new alarms and sell new books, searching for the next sign of His coming. No wonder they threw poor Jeremiah down the well. I felt like doing the very same to these false prophets after Y2K passed and civilization… burped. As always, your comments are enlightening and thought-provoking. I truly appreciate your thoughts and insights. We seem have very similar biblical leanings. It is a pleasure to sharpen iron with you. God bless you. The body of Christ needs strong, insightful believers like you to encourage, teach, and reprove us along our walk with Christ. Well done Robert. This has been so rampant in the news and at the water cooler this year that I am so glad you explained it so coherently and precisely and I love your conclusion. Here is what we know….we should trust in Christ today and then we have nothing to fear from nature or from any man for we are safe and secure in Christ’s hands and in the Father’s hands. Indeed, is there any place more secure than that in all the universe? My advice would be for you to make sure that there is no hidden sin in your life first. Ask God to reveal to you any changes He wants you to make. Then I would simply trust Him. I do not know your specific circumstances, but I know God loves you and is powerful enough to supply all your needs. Continue to seek Him and His will. Read Matthew 6:25-34 and believe it.